ANNIVERSARY OF THE PENNY BLACK DOUBLE HEADS. GB sterling cheques. GB sterling cheques. 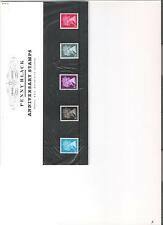 GB 2015 - 175th Anniversary of the Penny Black Presentation Pack . Dispatched with Royal Mail 2nd Class Letter. 1990 SG1467/7 150th Anniversary of Penny Black.cat£9. Excellent condition, complete with plastic sleeve. GB 2000 ROYAL MAIL PRESENTATION PACK PENNY BLACK FACSIMILE LIMITED EDITION REPRODUCTION PACK These fascinating packs contain reproductions of signifcant British Stamps issues. Our aim is TO BE THE CHEAPEST and the BEST…. however mistakes can happen, if we make a mistake, let us know, we will sort it out! Five stamp set. Mint and never hinged. Issued 10th January 1990. RARE UNDATED BPMA PENNY BLACK 175th MACHIN. GOLD MACHIN STRIP IS UNDATED WITH NO YEAR SECURITY CODE B5GB15. UNDATED GOLD '1ST' MACHIN IS. 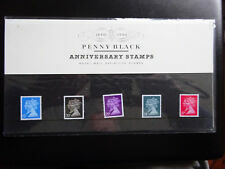 GB 2015 PENNY BLACK 175th ANNIVERSARY PRESENTATION PACK No 510 MINT STAMP SET SGMS3710 #510. GB 1990 PENNY BLACK PRESENTATION PACK No. 21 SG 1475-1478 MINT STAMP SET. THE CLASSIC PENNY BLACK. AT STAMPEX 2000. 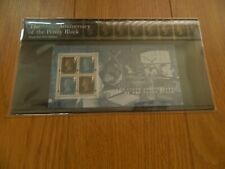 GB - PRESENTATION PACK - PACK NO 21 - PENNY BLACK ANNIV. stamps to 37p value. FOR THE 175TH ANNIVERSARY OF THE PENNY BLACK.